I'm used to paying more for Apple devices. I don't like it, but there you go. A 20% premium over a comparable competitor device is typical. A 50% premium is painful. 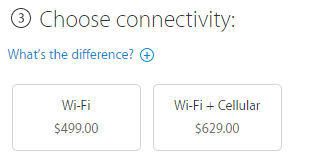 $9 vs. $130 for cellular connectivity? Yeah, the iPad is LTE and the ASUS is "4G", but that's one hell of a price premium. As long as they keep making better software and hardware and have a better brand name and build quality, they'll keep charging that premium. It's obvious why that 'Android' tablet is so much cheaper.